A team of scientists say a melting glacier in Canada's Yukon has caused a river to completely change course. Their findings, published in Nature Geoscience, show how climate change can cause surprising geological events. The Slims River once flowed out to the Bering Sea, but now it flows into the Kaskawulsh River instead. 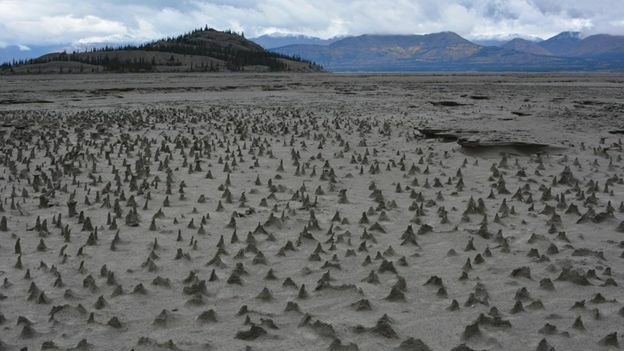 This phenomenon, known as "river piracy", typically takes centuries but the study documented it over the course of one spring. "Nobody's ever seen a river piracy occur in modern times, at least to my knowledge," lead author Dan Shugar told the BBC. The geoscientist at the University of Washington Tacoma says he and six researchers from Canadian and American universities had planned to study the Slims River last summer. But when they arrived in the Yukon it was barely flowing. They discovered that a small channel had eroded in a large glacier that fed a number of small lakes. The glacial lakes used to feed two river systems - the Slims River and the Kaskawulsh River - but when water from one lake poured through the channel into another, it cut the Slims off from its water source. The event is known as river piracy or stream capture, and can take thousands of years. But the researchers documented the piracy of the Slims River in just one spring. Prof Shugar said his colleague, John Clague, at Simon Fraser University in British Columbia, had predicted this event just a decade before because of the area's unique geological formation. But no one knew when or how quickly the stream capture would occur. River gauges show an abrupt four-day drop in late May 2016, which then continued over the summer, the study found. By the time Prof Shugar and his associates got there, the Slims was basically "a long, skinny lake". "The Slims River was essentially cut off from how it was flowing before," he said. The change in the river's flow affected the whole landscape. Sheep are now grazing on the exposed river bank, while other rivers in the area are running high. Fish population, wildlife and lake chemistry will continue to be affected, the study noted. In the big picture, Prof Shugar said, the piracy of the Slims is a reminder that climate change "may bring surprises that we are not appreciating fully and that we're not necessarily prepared for.